Lyon (France); September 29, 2015: Ambassador of Pakistan to France, Mr. Ghalib Iqbal has asked French Businessmen to invest in Pakistan. He was addressing French Businessmen at Lyon Chamber of Commerce and Industry, this afternoon. Lyon is the Business hub in the south of France. The Ambassador said that Pakistan offers wonderful opportunities for French investors. He stated that Pakistan is a very good destination for those who want to make profits through business. Admitting that there were a few security issues in Pakistan, he said that these were basically the issues of perception. He emphasized that perception cannot be changed without actually witnessing the reality. He invited Lyon businessmen to visit Pakistan in order to explore the investment and business opportunities with potential counterparts. For this purpose he announced that the Government of Pakistan could organize a visit of a delegation of French Businessmen to Pakistan so that they could see the actual state of affairs with their own eyes. This would also give them the opportunity to meet with potential business partners in Pakistan. The Ambassador said that the annual trade volume between Pakistan and France (around 1.5 Billion US$) has the potential to grow by 300% over the next three years. He pointed out areas of investment and trade between the two countries such as energy, agriculture, mining and minerals, automotive parts, textiles, fisheries, infrastructure and chemicals and pharmaceuticals. He encouraged French businessmen to explore business options in Pakistan, since Pakistan offers a favorable business environment, which is backed by the full support of the present government. The representatives of French companies, Alstom, Schneider Electric, Vinci and Sunberg, which are already operating in Pakistan, also spoke to the participants in order to share their experiences of doing business in Pakistan. They said that working in Pakistan was extremely profitable and safe and that French businesses should take advantage of this opportunity. 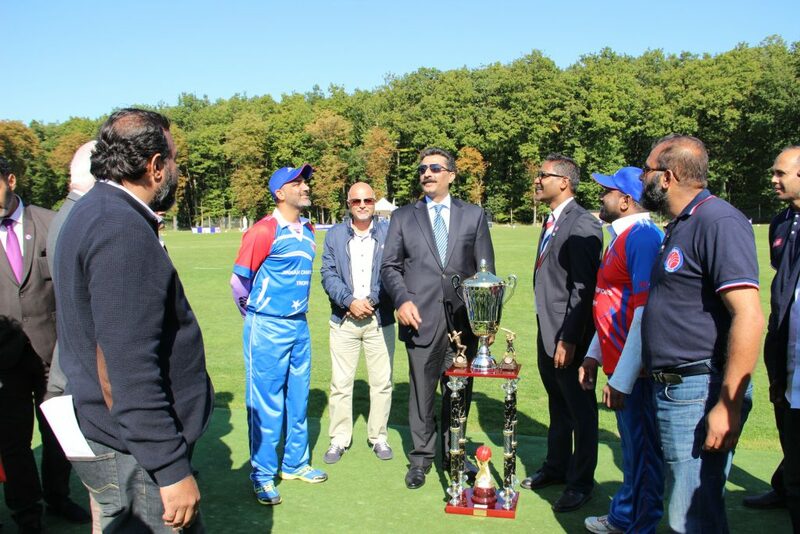 Paris; September 27, 2015: In collaboration with France Cricket, the Embassy of Pakistan in Paris organized a cricket tournament. 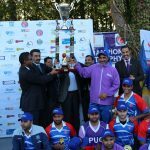 Paris University Cricket Club won the trophy. The Ambassador of Pakistan to France, Mr. Ghalib Iqal was joined by the Ambassador of Sri Lanka to France and Indian Deputy Head of Mission in Paris to give away Jinnah Trophy to the winning team. Among the slogans, the Ambassador announced that the winners will be sent on a one week visit to Islamabad and given opportunity to meet the president of Pakistan. The Ambassador also announced that Holding of Jinnah Championship Trophy will now be a regular feature of France Cricket and that the winner team of next year will be given an opportunity to visit Deosai Planes and stay at a nice place, apart from their one week stay at a five-star hotel in Islamabad. 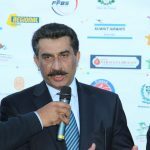 The Ambassador further said that the tournament will remain an event of France Cricket and the Jinnah Trophy will become a symbol of Pak-French Friendship. This final match was played at France Cricket Stadium of Dreux, which is a small town outside Paris. The mayor of dreux was also present there. 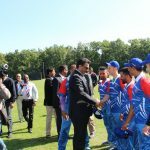 In his address he thanked the ambassador for holding this tournament and said that it will help popularize cricket in France. France Cricket is official governing body of cricket in France. 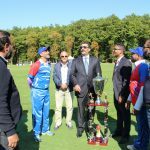 The Jinnah Championship Trophy tournament was organized under the auspices of France Cricket. 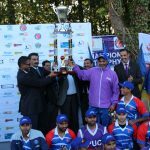 Sixteen best teams of Division I and II of France Cricket participated in the event. Northern Cricket and Paris University Cricket made it to the final and the later won. The teams which consist of players from all over France, include many players of South Asian origins. Large number of cricket lovers watched the matches. 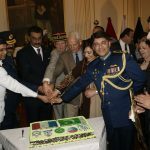 The Ambassador of Pakistan to France Mr. Ghalib Iqbal has said that the people and Armed Forces of Pakistan are fully capable of defending their country against any aggression. He was speaking at the 50th Defence Day of Pakistan to commemorate the victory of Pakistan against India in 1965 War. He said that the people and Armed Forces of Pakistan have proved that they are invincible and that no external or internal power can inflict any harm upon it. He further said that today, in the same spirit, our Armed Forces backed by the people, are engaged in a war against terrorism which is dangerous and deceptive, but with courage, determination and unity we have broken the back-bone of the terrorists. The ceremony was held in a simple but dignified manner here in the Embassy of Pakistan this evening. 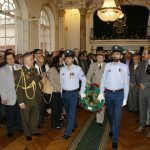 Floral wreaths were laid ceremoniously to commemorate the martyrs of 1965 war, war on terror and French Wars of Liberty, separately. 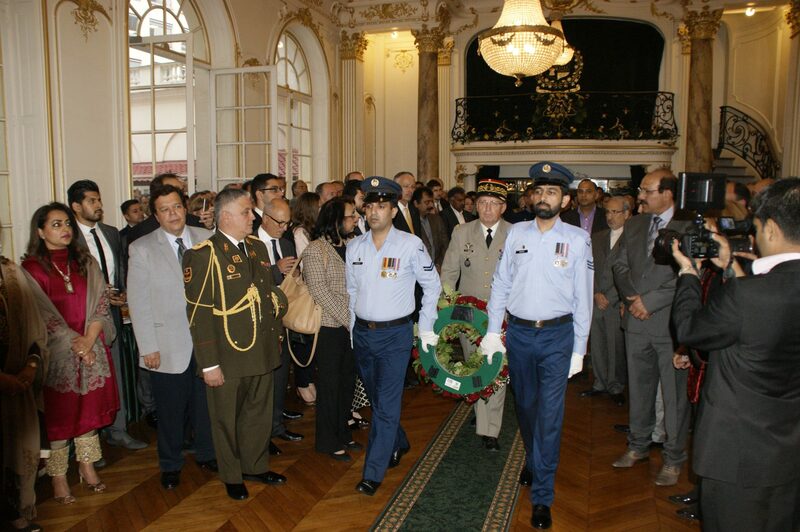 French General d’Armee Burno Dary, General de Division Stephane OVAERE and Air Marshal Muhammad Salman laid wreaths. The National Anthems of both the countries were played. 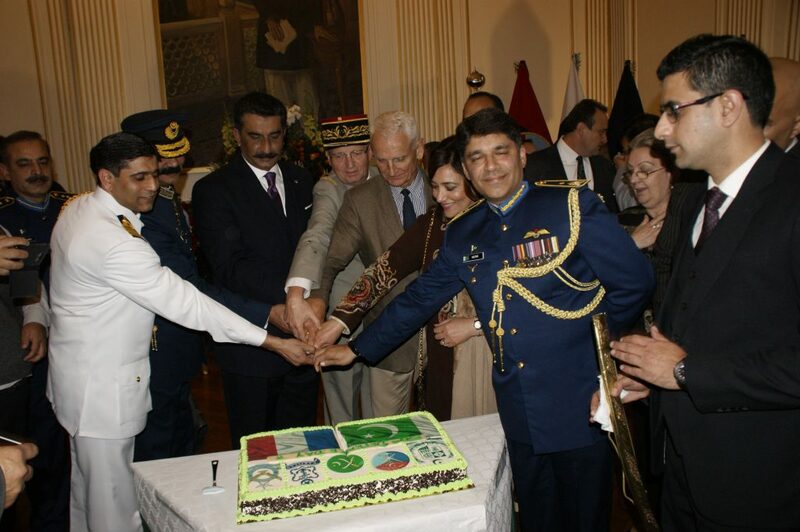 The Ambassador, French Army representatives and Defence officers of the Mission cut the cake to mark the beginning of the ceremony. Army and Naval Attache Captain Rashid Mehmood read out a special message from President of Pakistan for the occasion, while Technical Attache, Group Captain Amir Bashir read out the message of the Prime Minister of Pakistan. Defence Attache, Air Commodore Fauad Hatmi also spoke on the occasion. He said that war against terrorism is today’s War and we are fighting it and we will fight with the same resolve which we demonstrated throughout our entire history. The day commemorates the sacrifices offered by the people and Armed Forces of Pakistan against Indian aggression in 1965. It symbolises the courage of the people of Pakistan expressed in their fight against cowardly aggression of our Eastern neighbour. It stands for professional excellence of our Armed Forces exhibited during seventeen days war, which was imposed on us by a hostile enemy. The day reminds us of our responsibilities as a Nation towards not only the defense but prosperity of our people and the country. 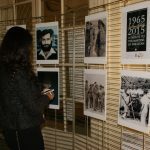 Apart from French Secretary Defense and National Secretary M. Louis Gautier, the officers and staff of the Embassy, diplomats and Defence Attaches of different friendly countries based in Paris, French War veterans, intellectuals, journalists and members of Pakistani community attended. 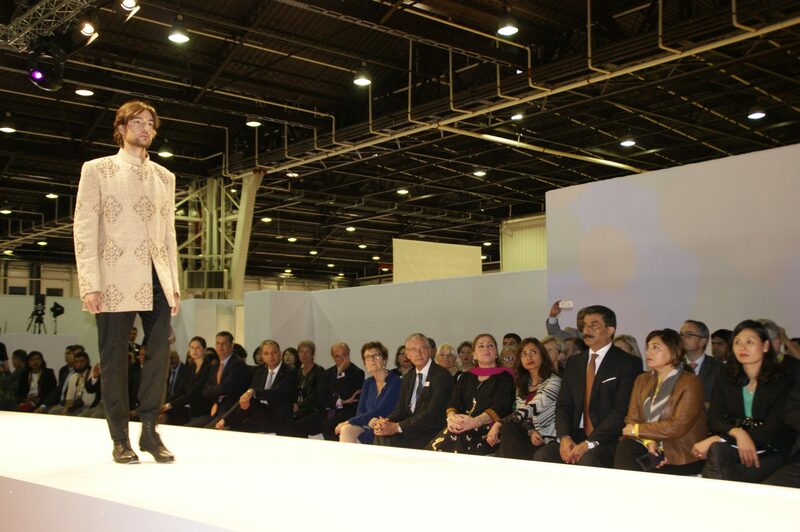 Paris, September 16, 2015: The Ambassador of Pakistan to France Mr. Ghalib Iqbal has said that Pakistani Fashion Industry has registered a growth of 79% recently which is one of the largest industrial growth rates in the world. He was speaking here this morning at a fashion show of high end Pakistani textile products. 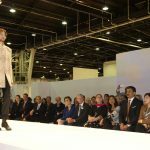 The Fashion Show was organized as part of activities of 37th edition of Texworld being held in Paris. Apart from the Ambassador, the President of the exhibition Mr. Michal Scherppe also spoke. 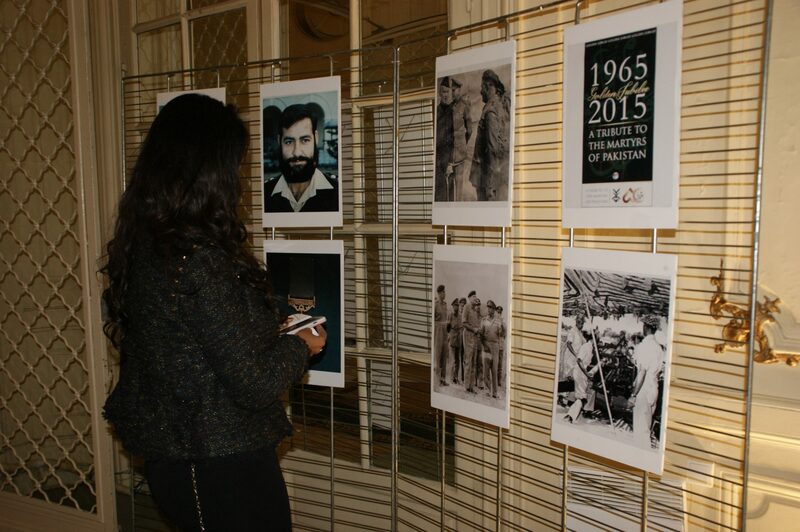 He welcomed and appreciated the participation of Pakistan in the Fashion Show organized as part of the event. The Fashion Show presented the designs created by Indus Valley School of Arts and Architecture and Sarena. The colourful and highly imaginative designs were appreciated by the spectators. The Ambassador announced that a more elaborate Fashion Show will be held in Paris next year to present high end Pakistani textile designs. Earlier, the Ambassador visited the stalls set up by Pakistani exporters. 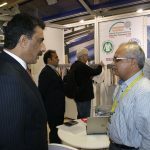 This year 35 Pakistani companies have setup their stalls in the Texworld, out of which 12 have been sponsored by TDAP. The rest are participating of their own. A total of 945 companies from 27 different countries are participating in the Fair. The Fair is held twice a year in Paris. During his visit to Pakistani stalls the Ambassador discussed with the exhibitors prospects of business development in France and assured them of continuation of full support and cooperation from the Mission. 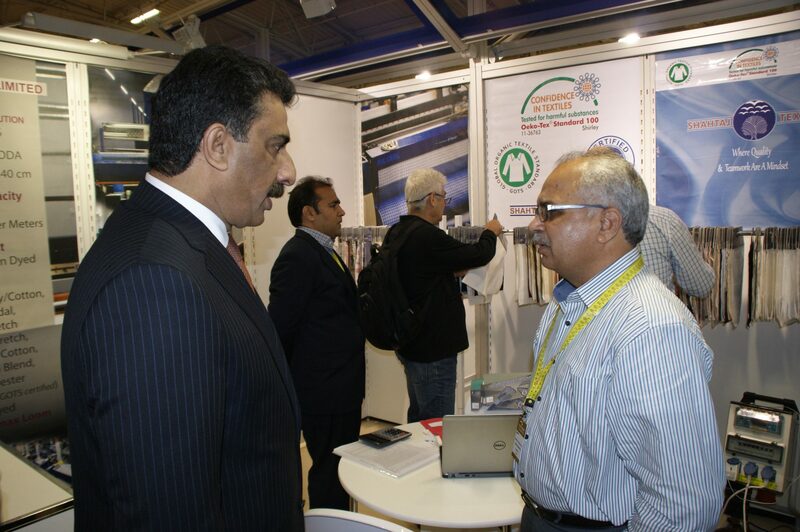 The exhibitors told the Ambassador that the response of the buyers was encouraging. 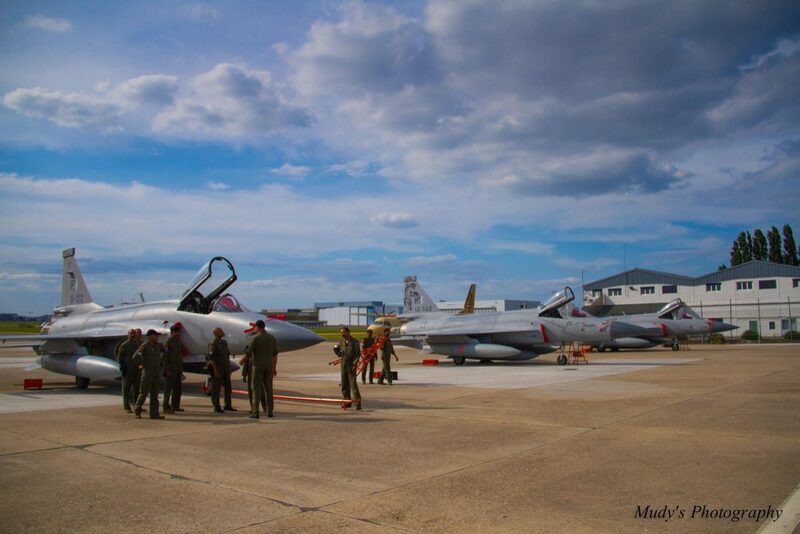 Three fighter aircraft JF-17 Thunder with pilots, technicians and engineers of the Air Force of Pakistan (FAP) arrived today at Le Bourget Paris, to attend the Air Show and the Le Bourget 2015. The 51th Fair organized by the French Association of Aerospace Industries will take place from 15 to 21 Jun, 2015, at Le Bourget Exhibition Centre. One of JF-Thunder fighter aircraft of Pakistan Air Force will conduct a demonstration flight every day, while another will be part of the static display showing the latest weapons technology. The spectacular acrobatic flight of JF-17 Thunder is considered the key to the show lounge, and will provide an excellent opportunity to showcase its advanced capabilities, also allowing future customers to evaluate its immense potential. The Paris Air Show and Space at Le Bourget meet 2,215 exhibitors from 44 countries worldwide and the Air Force of Pakistan is proud to participate. It should be noted that 150 aircraft representing the major aeronautical industries will be present at the show. The first four days of the Show will be reserved for trade visitors, followed by three open days for the general public. 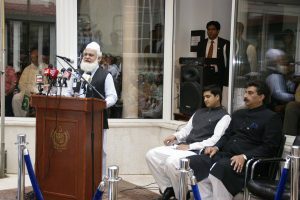 Minister of State of Religious Affairs and Inter Faith Harmony Pir Muhammad Amin ul Hasnat Shah has said that the Independence Day this year has brought the message of success and hope for the nation. He was addressing the Officers and Staff of Embassy of Pakistan, Paris and members of Pakistani community living in Paris on the occasion of Flag hoisting ceremony on 69th Independence Day of Pakistan. Ambassador of Pakistan in France Mr. Ghalib Iqbal hoisted National Flag to mark the occasion. The Minister of State in his address highlighted sacrifices made by the people for achieving the Independence sixty eight years ago. He said that the people and government of Pakistan and all its national institutions have worked hard to put the country back on way to peace and progress. Addressing the members of Pakistani community present here, he said that overseas Pakistani are real asset of the country and that they are playing vital role in the up left of its economy. Ambassador Ghalib Iqbal in his address impressed upon the members of Pakistani community to merge into the political and social life of host country. He asked them to learn local language in order to make inroads into French politics and media. He pointed out that since last Independence Day, country has made remarkable progress towards stronger economy, stability and better law and order. In this respect, he said civilian and military institutions have worked hard in total harmony to achieve the goals of elimination of terrorism and restoration of economy. Earlier, he hoisted the National Flag as National Anthem was played. Army and Naval Attache Captain Rashid Mehmood read out the message from the President and Second Secretary Mr. Ammar Amin read out the message from the Prime Minister of Pakistan for the Independence Day. Children in colourful dresses holding National Flags raised slogans amid milli songs being played. 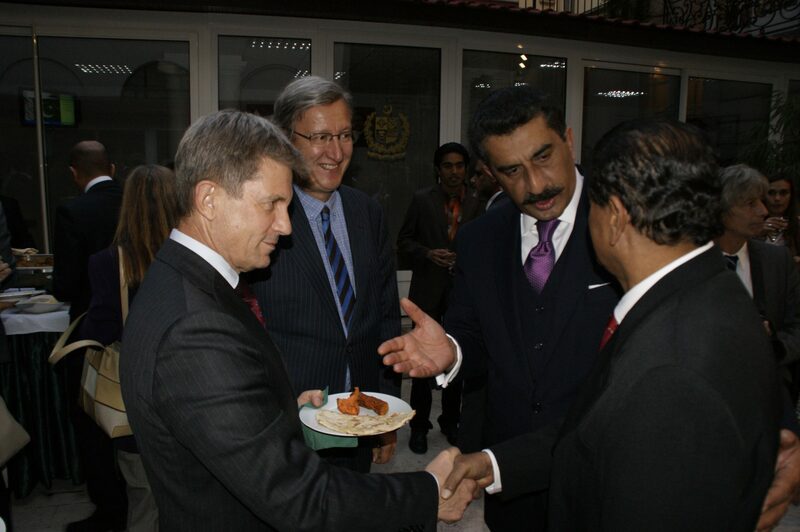 The officers and staff of the Embassy, their families and the members of Pakistani community attended the ceremony. The ceremony began with recitation from Holy Quran.